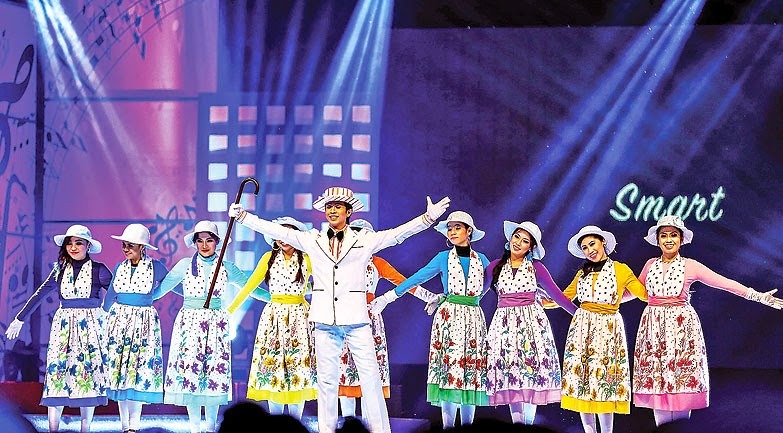 THE 11th Radio Televisyen Brunei (RTB) Awards feted local artistes, actors, radio and television presenters as well as local producers and authors yesterday at the Jerudong Park Amphitheatre. The guest of honour was Haji Mohd Rozan bin Dato Paduka Haji Mohd Yunos, Permanent Secretary (Media and Cabinet) at the Prime Minister’s Office. Also present were Haji Idris bin Haji Ali, Deputy Permanent Secretary (Media and Cabinet) at the Prime Minister’s Office, Haji Mohammad Suffian bin Haji Bungsu, Director of RTB and other government senior officers. The event is in recognition of a number of categories – the RTB Special Awards, ‘Insan Seni’ Awards, Special Jury Awards, 10 popular categories, 13 TV [roduction categories and six radio production categories. Eight RTB Awards had already been presented during the RTB Carnival at Times Square Shopping Centre on December 1. The objectives of the event were to give recognition and appreciation as well as to encourage healthy competition amongst officers and staff members of RTB, authors as well as the private sector in producing high quality shows and programmes, motivate the officers and staff members of RTB in producing a more creative, innovative, high quality radio and television shows and as a brand in giving awards to artistry or local artists in the field of radio or television production. Four individuals were awarded the RTB Special Awards for their invaluable services to the station. They were Hajah Hanafi Jofferi, Zainal bin Tinggal, Pg Hajah Mariam binti Pg Metali and Haji Anuar bin Haji Abdul Hamid. 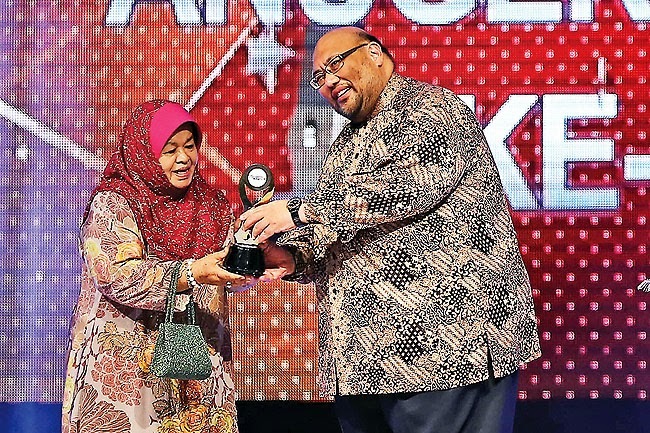 Long-time actors Pg Hjh Masquin binti Pg Hj Mohammad and Hj Matnor bin Hj Mat Yasin, better known by his stage name “Awang Jambul”, received the ‘Insan Seni’ Award. Another special award was the Special Jury Award which went to Khairul Salleh bin Haji Abdul Rahman for his ‘Menjejaki Hubungan Brunei-China’ (Tracking the Brunei-China Relationship), and Nurul Nadhsyafiqah binti Mohd Shahrizan for her winning performance as an abused child in the 993 Trace show. 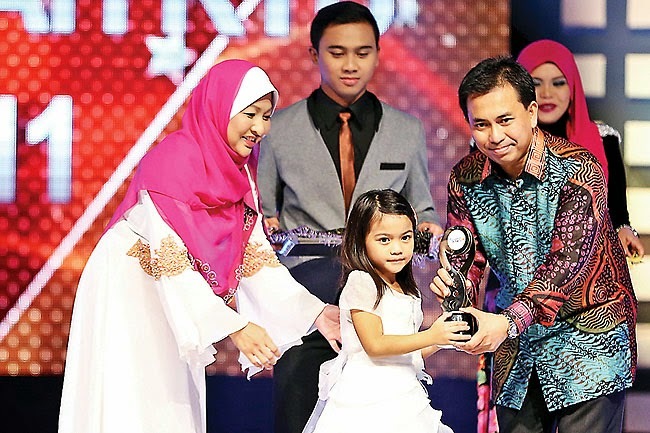 Haji Muizzaddin Dato Paduka Haji Adanan bagged the Popular English Newsreader Award, Ummi Masithas binti Othman won the Popular Radio Newsreader Award and Mohammad Fahmi bin Lasa the Popular Malay Newsreader Award. The Popular Female Radio Presenter was Hajah Fauziah of Harmoni FM while Alif Amsyar of Pelangi FM won the Popular Male Radio Presenter Award. The Popular Female Actor Award went to Pg Hjh Rokiah binti Pg Hj Abdullah and the Popular Male Actor Award went to Md Tauffek bin Ilyas. The Popular Singing Duo/Group was A Band Once, while Neff Asli and Maria bagged the Popular Male and Female Singer awards respectively. 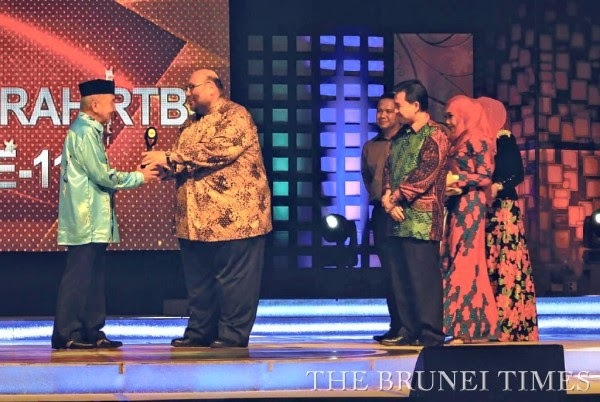 BANDAR SERI BEGAWAN, Sunday, December 7, 2014 - RADIO Televisyen Brunei (RTB) held its awards ceremony yesterday which saw employees rewarded for their contribution to the company in 39 categories. The ceremony – held at the Jerudong Park Amphitheatre – lets local producers and employees share their contributions and accomplishments with the public. Gracing the biennial event as the guest of honour was Permanent Secretary (Media and Cabinet) at the Prime Minister’s Office Hj Md Rozan Dato Paduka Hj Md Yunos. The awards were further divided into three separate categories – television productions, radio productions and ‘most popular’ awards. Special awards were also handed out to employees for their dedicated and lengthy service to RTB. Most notable was Pg Hjh Mariam Pg Metali who received her award for her services to RTB since 1959, serving as a radio and TV announcer. She also contributed to the formation of the little star singing competition (Pertandingan Bintang Kecil). “The awards ceremony was not aimed to differentiate the local talents in the sultanate but to (motivate the employees) to continue to strive and improve their quality of work.” said Hj Md Suffian Hj Bungsu. The RTB awards ceremony was first held in 2001.